Published by Sterling, New York, 2011. One of the best known Jewish photos of the 20th century shows a little boy of eight wearing a beret and a grin. The boy is Lulek, the son of a Polish rabbi, Moshe Chaim Lau. Against all odds, Lulek survived the Holocaust under the protection of his older brother Naphtali (Tulek), who brought him to mandatory Palestine and saw him rise to greatness as Israel’s chief rabbi. There was a Russian prisoner called Feodor who made earmuffs for the little boy in the camps, stole potatoes and made soup for him. Not till 2008 did Rabbi Lau discover that Feodor’s two daughters were still alive in Russia; the rabbi arranged for them to visit him in Israel and he nominated the Russian as one of the Righteous Among the Nations. Rabbi Lau is now one of the greatest exemplars of the long roll-call of Jewish genius. Those who knew his father testify that his son shares his amazing gift of eloquence. Australia has vivid memories of Rabbi Lau’s spellbinding addresses in its midst and can hardly believe that his mastery of English came out of his efforts as an adult to learn the language. In Israel of course he is admired as a lucid, inspiring expositor in Hebrew. The harrowing wartime story of Lulek cannot be encapsulated in a few sentences for the purpose of a review. One has to read the book, sometimes over and over again, and to stop trying to hold the tears back. The early days in Eretz Yisra’el also cannot be encapsulated, though this time the rabbi has re-evoked his eight-year-old grin as he recalls learning to be a child and recounts episodes that are not without their droll humour. 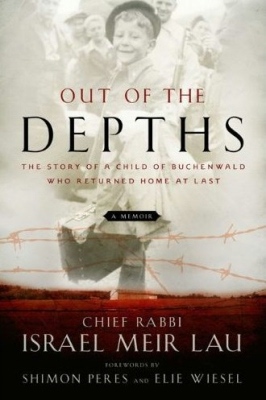 Rabbi Lau disarmingly assures us that the book is not an autobiography and does not attempt to document his distinguished rabbinical career, starting in a poor district of Tel Aviv and reaching its inexorable culmination as Israel’s Ashkenazi chief rabbi, chairman of Yad VaShem, and holder of the Israel Prize and the French Legion of Honour. It is not only Shimon Peres and Elie Wiesel, distinguished friends who have written forewords to the book, who have met and been influenced by the author. His path has crossed those of monarchs, popes and presidents, and played a sometimes crucial role in the events of modern history. Israelis – even those who have no time for God, the Bible or Jewish observance – secretly or openly admit that they respect Judaism more because of Rav Lau. Everyone should read his book. This entry is filed under Articles, Book Reviews, Holocaust.